We understand, everyone holds a special place in his or her heart for their own relatives, especially the elder set who more often than not tell priceless stories, bear gifts and use the internet in bizarre and awe-inspiring ways. However, when it comes to artistic muses, we're fairly certain your grandmother's got nothing on Adelaide. Adelaide is the muse of a photography series, aptly titled "Adelaide." The artist, Adelaide's granddaughter, is also named Adelaide, Adelaide Ivánova. Paying attention? 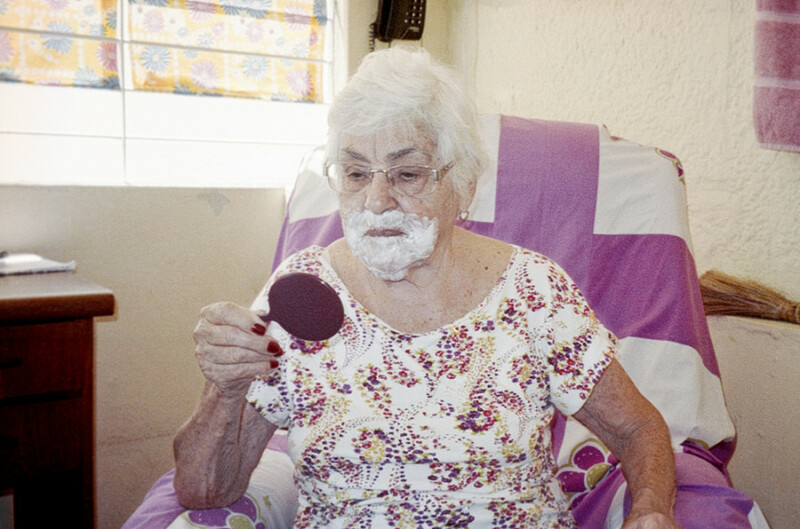 For years Ivánova has chronicled the life of her 93-year-old grandmother in her home of Reclife, Brazil in deliciously bright snapshots that feel more like summer camp snapshots than traditional portraits. "In the beginning, 2006, it was just the desire to spend time with her, doing more than having tea or accompanying her to doctors," Ivánova explained to The Huffington Post. "She had a lot of fun as well. Later, in 2011, after I started studying photography in Berlin, my teachers noticed that there was a project [here], it just needed some thematic improvements. So the next time I visited her I said 'Lady, now we're going serious.' And she turned into a sort of co-author, suggesting locations or situations in which she would like to be photographed. She'd call and say 'Little daughter, I am going to oculist, come take my pic!'" The images, bursting with color and feeling, are simultaneously playful and profound, capturing brief moments of a life far too complex to fully understand. Whether donning party sunglasses or doing impromptu gymnastics in bed, Adelaide appears far more vibrant and vivacious than the stereotypical nonagenarian. Yet despite the silliness that runs generously through the series, they possess a raw and sometimes dark honesty as well. "Adelaide, born in Brazil in 1921, bore sixteen children, fourteen of whom lived into adulthood," Ellyn Ruddick-Sunstein explained on Feature Shoot. "After the bankruptcy of her husband’s grocery business, she supported her children by selling cakes. In her old age, it has become difficult to walk, and she no longer practices yoga. Her days are spent sewing and reading. She enjoys crossword puzzles." 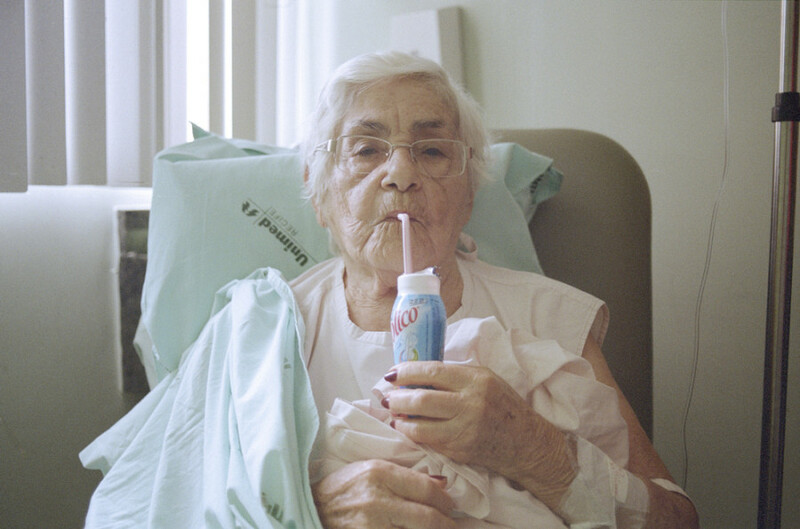 Depicting the ups and downs of old age was part of Ivánova's mission, thus providing documentation of a phase of life that often fades from public view. "My main desire was to make a project in which the subject matter is a person that represents elderly, a group that is invisible in society, and photograph her as one would photograph the 'visible group.' So even though there was a point in which it turned into a 'real project,' that is why I kept photographing her as I photograph my friends when I am not working: in trashy, spontaneous snapshots; not on extraordinary situations, but in everyday ones. The same way people photograph youth." "From her side, she feels empowered by the fact that, through her images, she can make elderly noticeable," Ivánova continued. "Especially now that she barely walks. It gives her the feeling of being useful. The feeling that even though she is so old and helpless, she and many other like her still matter." See the beautiful Adelaide in all her glory below and declare your love for her in the comments.